At Your Service - At Your Convenience. Work On Wellbeing Ltd is a unique, onsite hairdressing and coaching service. 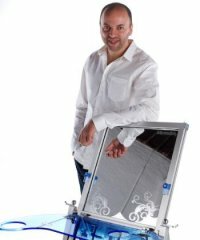 Gary Brightbart brings you Freelance mobile hairdressing and LifeWorks coaching to the Leeds, Harrogate and Bradford areas for men and women. Visiting your home, office and workplace, I use the Microsalon, the unique, in-house designed, portable styling station to enable a professional and consistent hairstyling service - wherever I operate. As a professional hairdresser in Leeds, I can help you make the most of your assets. Work on Wellbeing have developed a great reputation. Using up-to-the-minute cutting and styling techniques, I am trusted for my high standards and great reputation in corporate head offices, organisations and private homes. This highly professional service cannot be matched and the prices reflect the standard and unique quality of the service. You save time and stress - no parking worries! - as I come to you in the privacy of your home or office. At Work on Wellbeing, I use only the very finest products and have a wide range of great treatments available for everyone so you can be sure of great looking healthy hair.